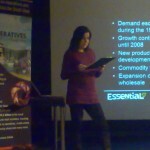 Last Friday (11 November 2011), I was at the Cooperatives-SW annual conference at the Cube Cinema in Bristol, titled “Growing Your Co-operative” and sponsored by the Co-operative Membership South and West. 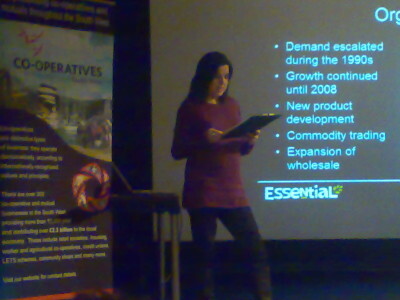 It was another sold-out event, featuring headline talks from Co-op Party member and Labour MP Kerry McCarthy, Eli Sarre of Essential Trading worker co-op (pictured), Carole Theyer of Sparks Inc and Jim Pettipher from Co-operative Futures. There were also some great workshops – I went to a finance workshop led by Ian Rothwell from Co-operative and Community Finance and a regulations one with Paul Martin of Kabin (details may appear on their event page) – and a brilliant lunch from Runcible Spoon (and those of you who know me will know I have been livid with some co-op event lunches!) with some time to chat and network, although I also went to a fringe meeting about the RISE problems. 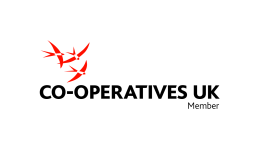 The event concluded with the formal AGM of Co-operatives SW (electing a new chairperson and approving transfer to a new co-op corporation) as well as a bit more chat afterwards. I felt it was a great event and well worth my time being there. I’m glad that some people from outside the co-op movement, from community businesses like the Strawberry Line Cafe and a few people considering joining or forming co-ops, were there and I hope it was good for them too. This entry was posted in Cooperatives and tagged bristol, co-op, community, conference, cooperatives, event, meeting, networking, social enterprise. Bookmark the permalink. An event that was well worth attending, good speakers, useful workshops and smashing food.